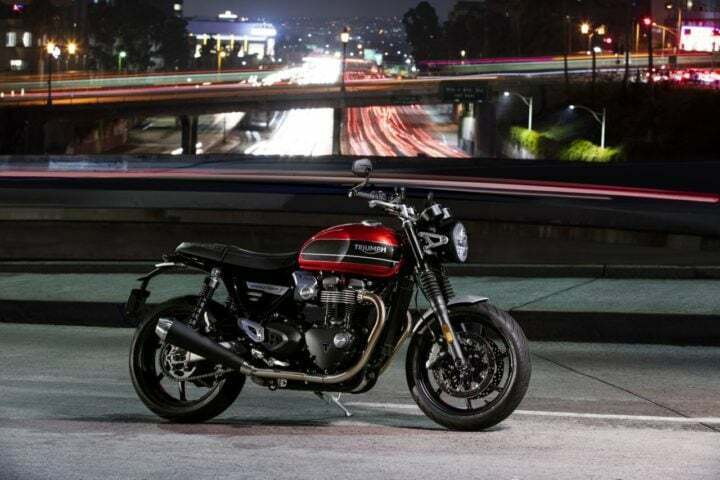 Watch: India-bound 2019 Triumph Street Twin Video! 2019 Triumph Street Twin has been unveiled globally, which is India bound next year. It classifies as a modern classic roadster. It comes as a fusion of Bonneville family and Thruxton R Cafe Racer. Triumph has unveiled the new Street Twin classic roadster. The motorcycle is India-bound and is expected to launch in India by mid-2019. The current Street Twin gets a 900cc engine. 2019 Triumph Street Twin is originally a part of the Bonneville family but gets the 1200cc engine of Thruxton R cafe racer. The 2019 version looks a bit more rough and sporty than the current one. Street Twin uses the 1200cc twin-cylinder engine that puts out 96 BHP @ 9750 RPM and 112 Nm of peak torque @ 4950 RPM. The engine pairs up with a 6-speed wet multi-plate assist clutch. Thruxton uses the same engine but Street Twin gets some revisions done to the original engine. 2019 Triumph Street Twin sits on the tubular steel with aluminium cradle frame. It uses 41mm cartridge forks with 120mm travel at the front and Twin Shocks with adjustable preload at the rear. For braking purposes, the roadster uses Twin 305mm discs at the front and a single 220mm disc at the back. The brakes pair up with a dual-channel ABS setup. The bike has a dry weight of 196 kgs. It uses 17-inch seven-spoke cast aluminium wheels on both the ends. It uses Pirelli Rosso Corsa III tires on both the wheels. The riding modes include Road, Rain and Sport, which are adjustable on fly. Lighting equipment includes LED Headlamps and LED tail lamps. Additional fitments include immobilizer, Twin Clocks and a USB slot come in as standard fitment. 2019 Triumph Street Twin is expected to launch in India by mid-2019. The current Street Twin goes for Rs 7.70 Lakhs (ex-showroom price). We expect the 2019 version to cost a bit more, taking the price tag up to Rs 10 Lakhs or so. Street Twin will compete with the likes of Harley Davidson Roadster. HD Roadster is priced at Rs 9.7 Lakhs and is also powered by a 1200cc engine. Upcoming Bikes In India 2018- KTM 390 Adventure, Hero Xpulse, Royal Enfield 650 Twins and More!